Electronic Gear Changer for automatic transmissions. Provide Tiptronic style gear changes for automatic transmissions. Operation is via a steering wheel mounted Remote Control, Formula One style.The Remote Control communicates with the Digital Display via Infra-Red signals and can be mounted in almost any location the user wishes. The SHIFTMASTER consists of two components, the Remote Control and a dash mounted Digital Display Unit. The Remote Control is Infra-Red and can be mounted on the steering wheel. Shifting is done instantly while driving with the ability to go from full automatic to manual and vice-versa with the push of a button. The dash mounted Control Unit diplays the gear the car is in and the mode. The control unit can also use steering wheel mounted switches or a floor mounted gear lever. 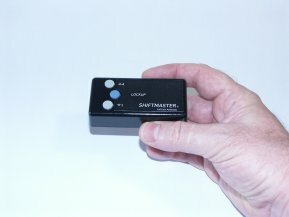 The SHIFTMASTER is simple to install and comes with a 12 month unlimited warranty. 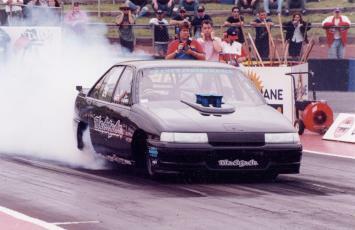 The SHIFTMASTER is available for Commodore, Falcon, Mazda, Subaru and Landcruiser transmissions. The Shiftmaster can also be fitted to any vehicle with a GM 4L60-E or 4L80-E transmission. The unit manually controls the automatic transmission while connected to the vehicle Powertrain Control Module. 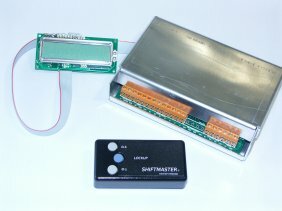 The SHIFTMASTER which has a patent pending, was developed as a joint venture between an Automatic Transmission Specialist and a Computer and Electronics Engineer with 50 years experience between them. Copyright (c) 2006 to Control Electronics. All rights reserved.